A private estate in Ecuador furnishes the proprietary wrapper of Ashton Virgin Sun Grown from high-grade Sumatra seeds. The region’s natural cloud cover serves as a delicate sunlight filter, slowly maturing the highest primings. Four- to five-year-aged Dominican tobaccos procured from the most fertile plants underscore a powerful cedar and espresso flavor against a vibrant, dark chocolate expanse. The Velvet Hammer! Every so often, you walk into a store and you see a cigar that stands out a bit from the usual cigars put out by a business. It’s like an Arturo Fuente Opus X Forbidden City, or their Opus X 20th Anniversary cigars, and they just take you by surprise. That’s what these VSG's are, and they’re every bit as rare as the aforementioned Forbidden City cigars. 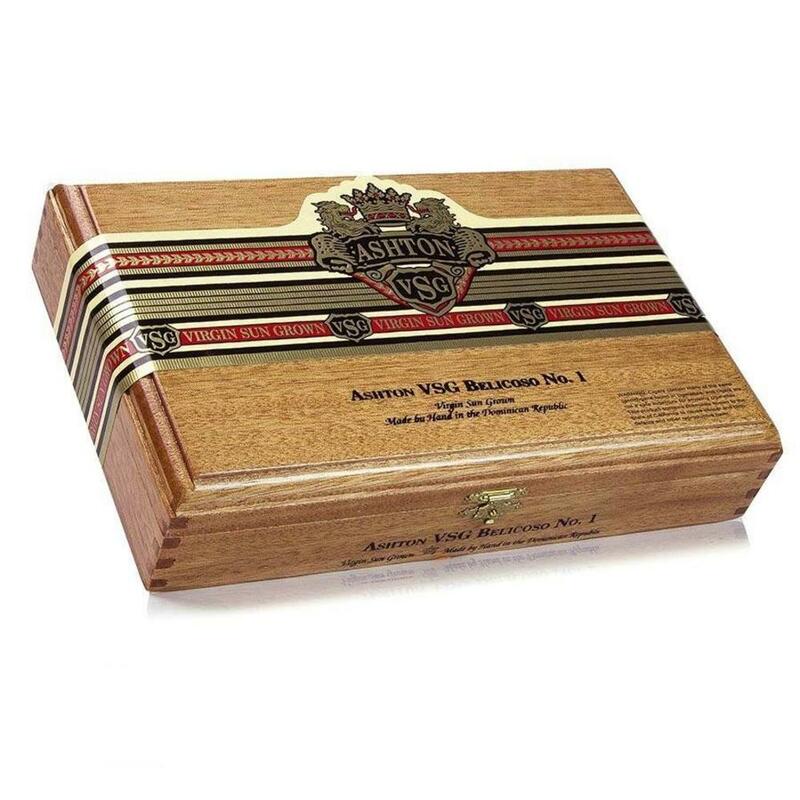 Ashton’s VSG line is made in the Dominican Republic by Arturo Fuente at the behest of Robert Levin, founder of Ashton. The VSG are not your average Ashton cigar, though, as their band announces; Virgin Sun Grown is the name of the cigar, and that imparts additional flavor with a better wrapper. The tobacco inside the cigar is from the Dominican Republic, aged in the Arturo Fuente factory for four to five years in order to bring out its hidden flavor. The wrapper, though, is the real difference; they use a Sumatran wrapper grown in the Dominican Republic, which provides greater flavor, a slight oiliness, and darker, earthier notes. The Ashton VSG smokes fantastically, and it tastes amazing. It has hints of coffee and dark chocolate, and an earthy tone that you will taste throughout the cigar. The Ashton VSG Belicoso is one of the best cigars on the market, and if you are ever able to find a few that are for sale, it is in your best interest to buy them before someone else does. They make a great partner to any dessert or coffee, and you will be happy with the purchase.